The Children's Theatre of Long Beach (CTLB) presents its first Renaissance Faire experience! Partake of delicious food, Play medieval themed games, create fairy wings or armor and top it all off with a 60 minute version of Shakespeare's "MUCH ADO ABOUT NOTHING!" Aug. 4, 2018 in Long Beach. (LONG BEACH, Calif.) -- NEWS: The Children's Theatre of Long Beach (CTLB) presents its first Renaissance Faire experience! Partake of delicious food, Play medieval themed games, create fairy wings or armor and top it all off with a 60 minute version of Shakespeare's "MUCH ADO ABOUT NOTHING!" Aug. 4, 2018 in Long Beach. For the last several years CTLB has been producing shortened versions of Shakespeare's works that are just perfect to introduce younger audiences to his timeless stories. "I thoroughly enjoy crafting the abbreviated versions of these classics," stated Philip. "I get to spend time with my favorite author and grapple with the essence of his work. I try not to just edit for time, I really look to the core of what is important about all the storylines and original message of the piece." "Much Ado About Nothing" is the story of young lovers Claudio and Hero getting married in just a week. Looking to pass the time, they conspire to get verbal sparring partners and confirmed singles Benedick and Beatrice to wed as well. Meanwhile, the wicked Don John conspires to break up the wedding by accusing Hero of infidelity. In the end, though, it all turns out to be "much ado about nothing." This year in addition to the play CTLB has created an entire mini Renaissance Faire at Bay Shore Community Congregational Church to go along with the bard's hilarious play. "We have Chef Cloyce Martin from 'Man vs Child: Chef Showdown' creating renaissance inspired food. Also, there are games and booths created specifically for this event," noted Hannah McMullen one of the show's coordinators, "as well as specialty acts that will perform throughout the day leading up to the play." Phil Schwadron began his career on Broadway at the age of 13 in the Tony award winning musical revival of On Your Toes. He appeared, along with his twin brother Steven, on television in Cheers and Beverly Hills 90210 and on film in Safe Passage and She's Out of Control. He and his brother currently write and perform music with the vocal comedy group The Poxy Boggards. Phil has a BA in theatre from CSU Northridge and an MFA from Cal Arts. He spent 10 years teaching Shakespeare, acting and tap dancing at the Orange County School of the Arts. He is also the author of "It's Not Hard to Learn the Bard (A Guide to Teaching Shakespeare to Teenagers)." Children's Theatre of Long Beach is a dynamic theatre company serving the Long Beach community and its families with school age children. CTLB strives to teach, inspire, and create experiences that will leave a lasting impression on our young actors and it is our hope that those experiences will inspire them in all aspects of their lives well beyond the stage. Learn more at: http://childrenstheatreoflongbeach.org/. 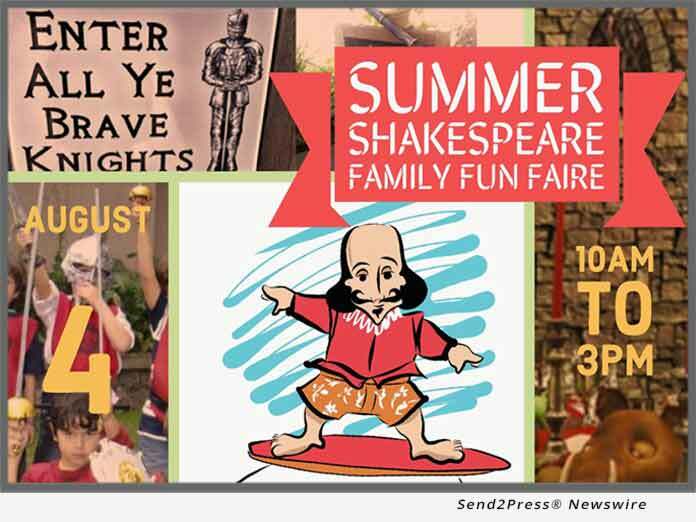 What: Summer Shakespeare Family Fun Faire and "Much Ado About Nothing"
When: August 4, 2018; Fun Faire from 11 a.m. - 2 p.m.; Play at 2 p.m.